Jim Mallinder expects England star Courtney Lawes to return from injury in Saints’ game at Sale Sharks on Saturday. Lawes has missed the past two matches with an ankle problem, with No.8 Sam Dickinson taking his place in the second row. But Saints will be keen to get their lofty lock back in action, with his regular second row partner, Christian Day, having been forced off in the win against Newcastle last Friday. Mallinder is hopeful Day’s injury is not too serious, and is even more confident about the fitness of key man Lawes and Tom Wood, who took a knock in the Falcons success. “Christian had just got a bit of a bad back,” said the Saints boss. “He mentioned it at half-time and he got a knock to it in the scrum. Hopefully he’ll be fine. 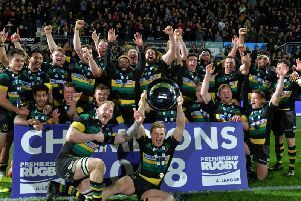 Kahn Fotuali’i was absent for Friday night’s 39-31 win at Franklin’s Gardens and will be missing again when Saints travel to Salford this weekend. The Samoan sustained a shoulder injury in the victory over Harlequins at Twickenham and Mallinder is not putting an exact date on his return. “He’s getting better,” Mallinder said. “It probably won’t be next week and it might still be a few weeks out, but we’ll see.